People work hard, lack time, lose money, and look at the sky. The US Oil War that began 20 March 2003 is approaching its fifth anniversary. The blood for oil trade continues. Carbon emissions keep going up and up and up. Noncombatants die at the hands of overweight soldiers who'd rather be home with their families. Meanwhile Baghdad's weather is turning a bit strange. Back home, gas-guzzling SUVs drive around with "Support our Troops" stickers. The U.S. treasury is hemorrhaging dollars. The bleeding in Iraq goes on. Bush the war criminal, the world's Climate-Changer in Chief, remains unimpeached and out of jail. Americans continue to be passive and obedient, while their consumer society is sinking into a self-made crisis of unsustainability. After all, evil actions and self-reducing patterns are just two sides of one and the same coin. Perhaps the Having Mode hadn't been such a hot idea to begin with, for what goes against Nature's flow will come to an early end. ... Europe's new energy plan 1.23. ... alpine heat record 2.7. ... Swiss glaciers shrink 2.7. ... Baffin now hottest for 1,600 years 2.21. ... human-induced US hydrology changes 2.22. ... UN: world fisheries face collapse 2.22. ... no more home insurance in Florida 2.23. ... commodities shortages looming 2.23. ... food shortages loom 2.24. 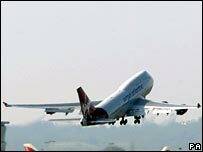 ... Virgin Atlantic first biofuel flight 2.24. ... Virgin Atlantic fuel composition 2.24. ...and the mad Hun says: Congratulations! ... Antarctic glaciers surge to ocean 2.24. ... UN: USA non starter on climate 2.25. ... global water crisis 2.25. ... climate change body count 2.26. ... Oil prices and the dollar 2.26. ... "there's no global warming!" (USA) 2.26. ... the costs of reading news 2.26. ... US cool to warming pact 2.27. ... the Bush war on science 2.27. ... [link to UCSUSA Federal Science and the Public Good Report] ... US Senate Committee "there is no climate change"2.27. ... doomsday seed vault opens in Arctic 2.27. ... Aussie-Kiwi climate cooperation AP 2.27. ... Oil at $ 102 2.27. ... G Palast Exxon & McCain. 2.28. ... S Bell the six trillion dollar chimp (pic) 2.28. ... Japan preps climate meeting 2.28. ... get your zero carbon home 2.28. ... the drought crop 2.28. ... Arctic ice cap may be gone this summer 2.29. ... Radiohead: the Big Ask campaign 2.29. ... EPA blocks Cal emission caps 2.29. ... crunch time on the bread line 2.29. ... Gore: climate no campaign issue 3.1. ... Lovelock: enjoy it while you can 3.1. ... Florida water talks have failed 3.1. ... Iran shifts Oil sales away from dollar 3.1. ... Rove: withdraw from Iraq, pay for Gas 3.2. ... climate skeptics point to cold spell 3.2. ... China halts coal exports 3.3. ... Oil at $ 104 3.3. ... Japan calls animal friends "terrorists" 3.3. ... Big Oil pays for US climate denial conference 3.3. ... Big Oil wants Yukon Flats 3.3. ... climate change's threat: Drought 3.4. ... medium-range weather predictions 3.4. ... USA Heartland Institute climate denial conference in NYC 2.3.-4.3. ... Teacher under fire for Gore's film 3.4. ... US WIREC 08 calls for renewable energy 3.4. ... Iraq war cost now beyond comprehension 3.5. ... US weather channel CEO denies climate change 3.5. ... Transatlantic AA Boeing 777 with 5 travelers 3.5. ... Sydney's coolest summer in 50 years 3.5. ... Faced with climate change, the Moron opts for ethanol 3.5. ... owners give up 3.6. ... Peak Oil? Peak Soil! 3.6. ... Oil at $ 106 3.6. ... Antarctic Ice melting unusually quickly 3.7.